Indiana’s first keyword advertising case is now set for trial. However, don’t hold your breath if you’re waiting for an answer to whether the purchase and use of a competitor’s trademark in keyword advertising is trademark infringement. The Angie’s List/ServiceMagic trial won’t take place for over a year. On May 6, a Scheduling Order set a bench trial for October 6, 2014 (at 9:30 AM in Room #216, United States Courthouse, 46 E. Ohio Street, Indianapolis, Indiana before Judge Sarah Evans Barker). A settlement conference was held between the parties in February 2013 but no settlement was reached. Based on the importance of this question to the parties involved, I expect this case to go to trial, however long that may take. In the meantime, you can review the Answer to Complaint and Answer to Counterclaims below. Stay tuned for updates. Indiana finally has its own keyword advertising case! Local internet powerhouse Angie’s List accuses ServiceMagic of using the “Angie’s List” trademark as a keyword in some of its Google AdWords sponsored link advertisements. While several courts around the country have ruled on this issue, in Indiana it is still undetermined whether the purchase and use of a competitor’s trademark in keyword advertising is trademark infringement. For those unfamiliar with keyword advertising, see the image below. 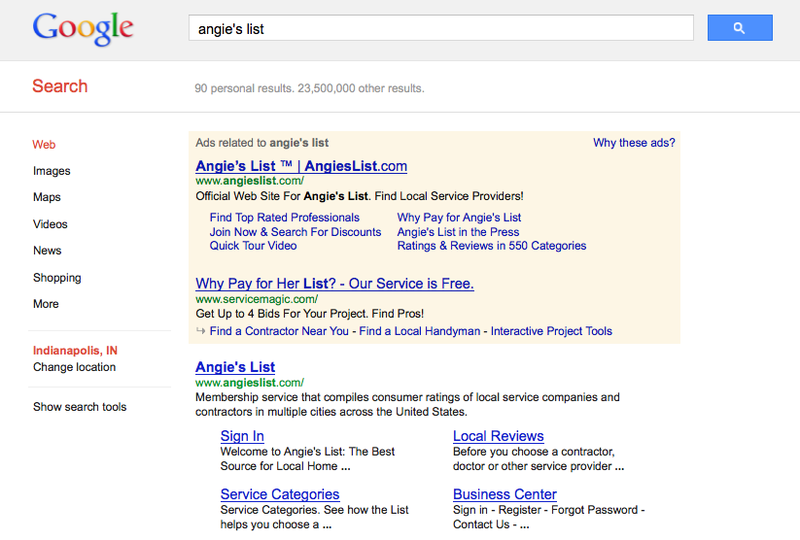 ServiceMagic pays Google to appear in the “Ads related to” box at the top of the search results for the term “Angie’s List,” directly below Angie’s List’s official site. Big companies hate this practice and small competitors love it. Google really loves it, because advertising is where Google gets a big chunk of their revenue. We’ll soon find out what the Southern District of Indiana, via Judge Sarah Evans Barker, thinks about it. This is no David and Goliath story either. ServiceMagic’s parent company IAC owns many major web products, including Ask.com, Match.com and Vimeo. Stay tuned for updates as the case proceeds. Angie’s List Inc. v. Servicemagic Inc.